The tires of my jeep crunch the tiny pebbled stones as I weave slowly down the driveway. Trees, as large as buildings, line the side of the gravel drive as if guarding a fortress. An army of twisted bark and thick-rooted foliage stand silently behind, extending for miles on end. The lime green ferns sway and dance in the light as I pass, welcoming me back. I am finally here, my favorite place on earth, The Great North Woods. The beaming headlights slice through the black of night, proving to be the only light for miles. The lights catch eye of the only place that I will ever call home. A clearing emerges, bearing a modest timber-frame structure, adorned with a sinking wrap-around porch. The cinder block foundation crumbles gently with age into the ground, making the first two steps warp and crooked. A long picnic table sits parallel to the house, taking up more than half the porch. The wood siding is worn and soft but bears scars and wrinkles from a long life. A clothing line droops across the entire side yard, with clothing pins randomly clinging to the rope. I step out of my car and take a deep breath in. The sweet air is fresh and carries the smell of the lake. A feeling of relief floods deep inside. I gaze upward to see thousands of sparkling lights strum across the deep black velvet sky. They are bright and clear and sit boldly in the sky, like crown jewels displayed in a high-end jewelry store. I keep my eyes fixed on the sky to allow the picture to burn into my memory. The clarity of starlight is not compromised by lights, pollution, or the hustle and bustle of city life. The night is eerily quiet. There is no movement, and the earth is silent. I quickly reach and fidget under the driver’s seat of my car in search of my high-powered Maglite. I leave the brights on in the car and the door wide open for an escape. Although childish, this ritual began early in childhood, during a visit from my mother when my brother had a group of friends up for a fishing trip. The house was destroyed and smelled of rancid meat and stale beer. She cleaned up the cabin and heaped the garbage into the garage, hoping to take it to the dump. After returning from the store late that night, she had a visitor. The door had been forced open and clung to the hinges like a loose tooth. As she flipped on the light, she met eyes with a 400-pound black bear, sitting human-like on his bottom eating spoiled meat by the fistfuls. My mother dropped all the groceries and sprinted for the car. The bear was not ten steps behind, and my mother was terrified. As she reached the car, she fussed with the keys jingling in her hand desperately trying to unlock the door. Unable to unlock the car, she sat and cried until my neighbors responded to the terrible screams and sprinted over with shotguns and flashlights in hand. Flashing their lights into the forest, they slowly inched toward the edge of the foliage in search for the monster. The bear was nowhere to be seen. To this day, the family loves to tease my mom about how massive the beast was and what actually happened that night. Although we give my mom a tough time, I still always leave the door open, just in case I have an encounter with an unwanted visitor. I slowly make my way toward the house, the tiny, deep volcanic red pebbles crunch under my flip-flops. The house is masked in shadows from the brightened headlights that shine directly on the front door. I slowly step up the three steps on the porch. The weathered wood whines and creaks as I move upward. Cobwebs hang in elegant patterns in every corner, glistening and shining like silk on display in the makeshift spotlight of my flashlight. I reach for the rusted screen door handle, also covered in cobwebs. As I force the door open, the springs squawk and squeal. I carefully insert the key and lay my body weight against the door. The seal is warped and holds a tight grip on the bottom right edge of the door, making for a trying entry. I stumble in after the door releases from the hook of the trim and reach my hand out for the light switch. The smell of sandalwood and faint mildew flood my nostrils as the lights dim on. Everything is exactly the same, outdated and full of stories and memories. In front of me, green, lumpy couches are positioned inward to the fireplace, with antique side tables placed on either side. Thick fleece blankets, that match the color of rug, hang on the back of the couches cleaned and waiting to be snuggled with. The fireplace is bulky and holds massive stones as large as dinner plates. Each stone has been hauled from the lake and meticulously placed. Oval-shaped wicker baskets are placed on either side, full of toys, movies, and blankets for guests. To the left is a kitchen far too small for my mother’s cooking talent, adorned with an avocado-green oven and microwave from the late 70s. A large oak table with room to fit twelve sits on an angle just to the right of the kitchen. Each chair is different, adopted over the years from different times and locations. Floor to ceiling windows line the walls, allowing for a perfect view of the lake. A tiny layer of dust wraps around everything in the house. To the right, a tiny hallway holds two bedrooms and the house’s only bathroom. I flop lazily on the large couch and allow myself to absorb the room. The energy is warm and welcoming to my soul. The house, which is usually crawling with families, friends and dogs, is silent and peaceful. I am home. Patagonia is a wild and vast country with seemingly infinite horizons, skies with ever changing clouds, and very long winters. The southernmost part of Chile is the most isolated place in the country. 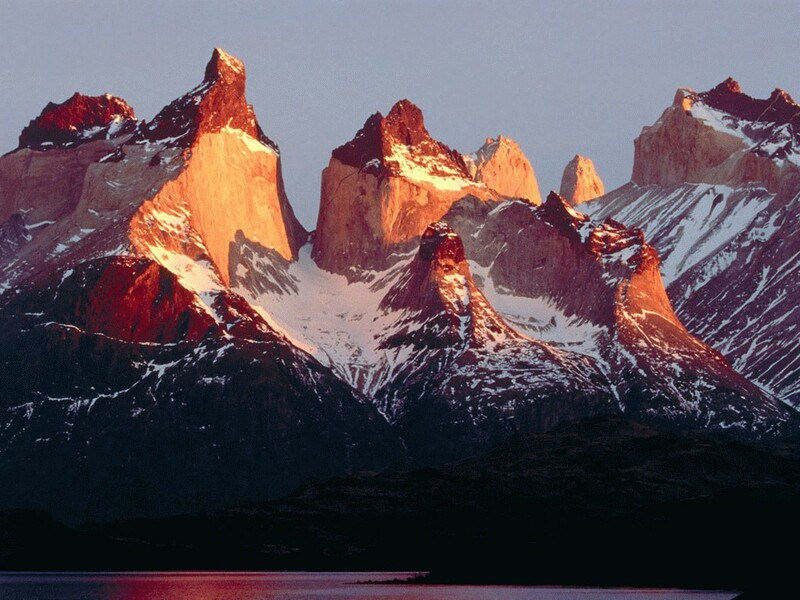 You can reach Patagonia by airplane or by land through Argentina. 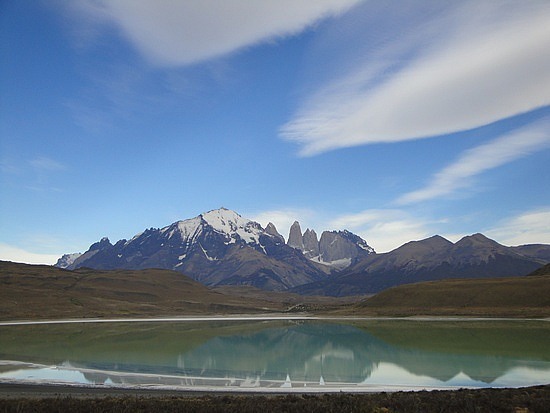 Patagonia lies in the very bottom of Chile where the land become dispersed into many little islands, canals, and finally emerges in the ocean. I lived in a city at the end of the world named Punta Arenas (Sandy Point). This region is known for its unique geography: islands, fjords, glaciers and icebergs. The winter nights in Patagonia are dark, long and cold. Summer days are long and bright. Patagonia is a pristine place, wild and silent where the nature remains still untouched by civilization. The only thing that breaks the silence in this desolated place is the strong and untamed wind that makes the trees surrender under its power. People call this wind Devil’s Broom because it blows away everything in its path. Patagonian trees suffer under these severe gusty winds. Consequently, the average height of the trees in Patagonia is below normal, but the trees are short and strong. One summer day in January, I and a group of friends planned a trip to the National Park Torres del Paine, which is one of the main attractions in Patagonia. 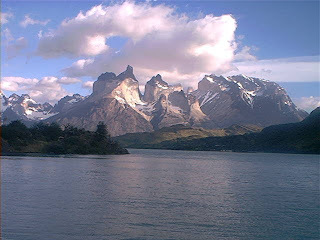 Torres del Paine in the indigenous language means The Towers of Blue Sky. You have to drive three hours on the gravel road to reach a city called Puerto Natales. Punta Arenas and Puerto Natales are located alongside the Magellan Strait. When I arrived to Puerto Natales, I could see a flock of black neck swans swimming happily in the cold water of the Magellan Strait. Even though it was summer, the weather was chilly and windy. After we stopped in Puerto Natales, we continued our trip to Torres del Paine. We drove for many miles through vast grasslands called pampas. I saw settlements and ranchos, sheep and grass all along the way. The trip seemed to be long in this far away land with no trees or mountains. I was observing this isolated landscape, when I witnessed one of the most spectacular views I have ever seen. 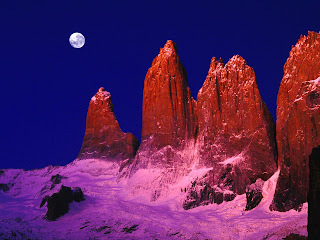 In the distant mountains, I saw the spectacular Group of Las Torres. This is the geological formation of three enormous gold-colored granite towers that give the national park its name. The towers are part of the Paine Massif rising from the east and dominating the Patagonian pampas. I was speechless. It seemed like the hand of a giant had mysteriously put the three granite towers there to look after the park. The flora in Patagonia is very rich. 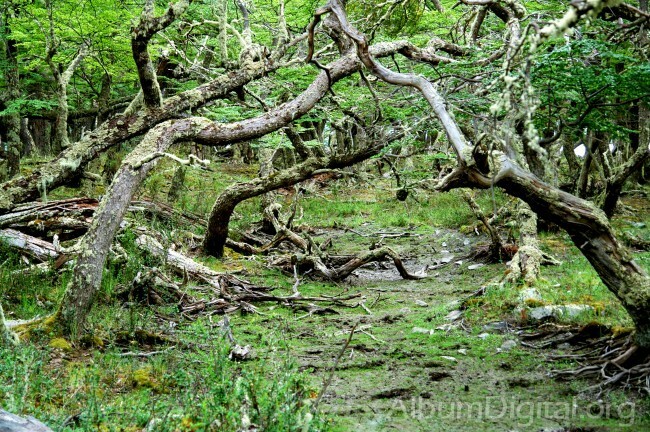 When we drove through the national park, I saw a millenary forest of Lengas. Lengas are short and strong dark-green trees with sturdy leaves. The vegetation is really spectacular. They grow many different kinds of flowers, and there is a Patagonian bush called calafate that has black sweet fruits. It is believed that if you eat this fruit once, you are destined to return to Patagonia. Fauna in Patagonia is very rich and diverse. I saw next to the road a group of guanacos rooming through the park. Guanacos are big animals with a thick reddish-brown fur, closely related to the llama. They are herbivores and eat grass and trees. In those vast latitudes, they run very fast. You should not approach the guanacos because they could spit at you. Guanacos spitting is a defense mechanism, and their spit is as fast as a shot. I also saw ñandus. Ñandúes are related to the ostrich, but they are smaller. They run very fast trough the Patagonian steppes and lay big eggs. In pampas, a wide variety of wild birds and wild geese live. Lakes and lagoons are a big habitat for wild ducks, beautiful black necked swan, and the unique and graceful Chilean flamingos that show their pink feathers to delight you. Flamingos have pink pigmentation due to their diet of algae and shrimp. The most majestic bird among all the birds is the South American condor. The condor lives in high mountains and is a huge bird that flies over the vast plains of the Patagonia observing the panorama from the height. The lagoons have a vast range of colors. One of the lagoons is called Laguna Amarga, and its color is emerald-green from minerals that exist in the deep water. When I was there, I left the car and touched and smelled the water because I wanted to be sure that the smell was really from the minerals. When I tasted the water, it was salty. Amargo in Spanish means salty or sour. Another lagoon is called Laguna azul due to the dark-blue color of its water. The fishing in Patagonia is a must. People can fish wild salmons and trout and also, one of my favorites, the king crab. The glaciers in Patagonia are millenaries; one of them is Glacier Grey. When I visited the Glacier Grey, I walked toward the big ice blocks. I always thought that the ice was white, but after being in this far away landscape, I realized that the ice is light-blue. Glacier Grey is a mass of blue-icebergs that are cold, immaculate, and untouchable. I continued walking to get closer to the ice blocks, but it was very difficult because the wind was so strong. The wind was so cold, that I felt it was penetrating inside of my bones, and it was so strong that I was barely standing up. There are not words to describe this place. The sound of the wind, the coldness of the air, and the beauty of the landscape mesmerize you. Returning to the shelter was pleasant after being in the cold. We sat by the fireplace, and we drank some warm coffee while we enjoyed the view of the glacier at the distance. The quiet crackling of the firewood and the comfort of the warm fireplace made me feel calm and restful. We sat next to the fireplace for awhile until we decided to get back to Puerto Natales, and we planned to stop in a ranch of a friend. When we arrived to Puerto Natales that afternoon, we went to a nice restaurant to have a delicious plate of scallops made in the Patagonian style. After the dinner, we were very tired and went to our hotel to have a very comfortable night sleep because the next day we needed to get up very early to go to the ranch. It was early morning, and the day was very pleasant. We drove to the Magellan Strait shore and we boarded a small boat. Then we crossed the channel. It was a short boat ride. On the other side the owner of the ranch was waiting for us in a jeep. The ride in the jeep was fun because we drove through the grass. We crossed little creeks and meadows. The jeep rode through narrow pathways. It was a big adventure, the air was fresh and pure, the sky was blue and the clouds were dancing in the blue sky. I could hear the birds singing, and I could see a lot of sheep wandering through the meadows. After an hour drive, we arrived at the ranch. The ranch was a big old house surrounded by a fence, grass, and flowers. There was a barn where the owner of the ranch kept the sheep’s wool. I also saw pigs, chickens and horses. The house was located in front of the ocean and next to the mountains. We spent the afternoon sitting by the fireplace. Then we had a dinner and we went to sleep. The next day, the people that worked in the ranch, the gauchos, prepared the horses for us, and we were ready to start our horse ride. Our guide was a Chilean gaucho, dressed with a white gaucho’s attire. The gaucho was very experienced in horse riding. A group of sheep dogs followed him. We rode for a while, and we saw a big group of sheep. The gaucho whistled at the dogs, and they begun to lead the sheep to the corral. The Patagonian dogs are trained to help gauchos with sheep herding. They group the sheep together, and with one whistle from the gaucho, the dogs understand what they have to do. The job of the gauchos without the dogs would be very difficult because they have to herd thousands of sheep. We rode the horses through the meadows, and we saw streams and creeks where the people fish salmon and trout. When we come back to the rancho, near to the lunch time, we were very hungry. The gauchos had prepared a fresh lamb outside in the open fire, the people prepared salad and we ate a very delicious meal. Then we visited the barn, where we learned how the people of the ranch shaved the sheep to get their wool. People in Patagonia export the wool sheep all over the world. Next morning, I returned home. My trip to Torres del Paine will always remain in my mind, and it will be forever an unforgettable experience. My father and I woke early that morning. We needed to make full use of the day. I took a quick shower, the warm water waking me and preparing me for the long trip ahead. Once we had gathered all we needed, we left our hotel room and began our journey. It was a brisk, warm mid-February morning in Tokyo. The sky was clear and surprisingly smog free. During our quick five minute walk to the Uneo station, we could see the early morning streets already beginning to fill with people. The train trip to Tokyo station was short and uneventful, the giant skyscrapers rushing by to the gentle sway of the train. Once we arrived at Tokyo station, we quickly made our way to basement level three of the seven story train station to find our 6:30 a.m. bullet train to Hiroshima. We found our seats in an empty car where I quickly called dibs on the window and settled in for our three-and-a-half hour train ride. The train started slowly, but as we got farther and farther away from the station we could feel it gathering speed as our bodies were pulled back into our seats. The train we were on was supposed to go 200 kph, and it sure felt like we were. Standing still in the moving train was hard. You could feel yourself being pulled to the back of the train by an unseen force. We were in the city of Tokyo for almost an hour before we saw our first patch of green. The city eventually faded away to lush green fields with small huts and rice patties. The early morning sun reflected in a way so that it seemed we could see each blade of grass. Looking farther ahead, the land slowly leaned upward into a low-mountain range covered in the same perfect green grass and forests. Around a bend, Fujiyama came into a view, its pearl white peak stood as a testament to the pure beauty of the country. The view continued this way, only being broken by the occasional village and patches of white snow. Slowly, the grass and trees became houses and streets. Then the houses became skyscrapers — we had arrived in Osaka. There was a brief stop at the station here, and from our right window we caught a perfect view of Osaka. It was city as far as you could see, like a blanket of steel and wood over the land. However, just as quickly as we had arrived, we were gone again. The scene was just like leaving Tokyo, but more sudden this time. We were back in the Japanese countryside almost like we’d never left. Slowly out of the window, we could see the ocean getting closer. It was a clear, crisp blue that stood in bright contrast to the dark green of the land. Then, eventually, the skyline gave way to city again but this one was slightly different. It was much smaller then the others. You could easily tell as we approached, and it lacked the defining skyscrapers of Japanese cities. This only meant one thing. We had finally arrived in Hiroshima. We got off the train in the small three-track station and quickly moved to the first destination on our list. The sun had been busy warming the air, and even though it was still only late morning it was quite comfortable. The air was a mix of fresh country and refreshing sea, but we were obviously in a decently large city. My father and I headed due west of the station down a busy city street. Hiroshima was a little different than Tokyo. There were many more cars on the road. In fact, most of the transport in Hiroshima was by car and not by foot or train like in larger cities. It was very much like the U.S.
As we walked, the cityscape eventually gave way to a large moat surrounding an island. 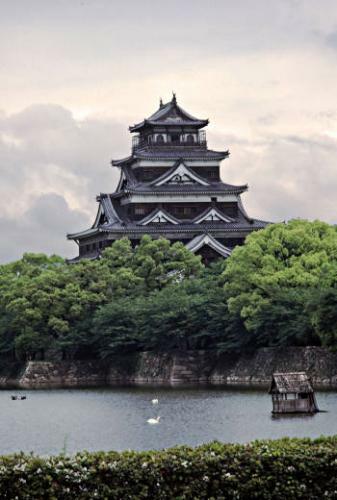 One of the things I love most about ancient Japanese architecture is the perfect-sided moats. This one was no different. The inside of the moat was built with polished stones and a sloping trap, where a variety of ducks and geese swam in the cool, still green water. In the back corner of the island, was a large, whitewashed, black-roofed, five-story building shaped with the traditional Japanese sloping roof shape. It was Hiroshima castle, rebuilt to almost perfect accuracy as a museum of feudal life in Hiroshima. We crossed the bridge onto the island and found there was much more than just the castle. It was, in a way, a park. All the original building foundations that were part of the castle grounds were still there intermixed with cherry blossom trees that had not quite started to bloom. We made our way to the back end of the island where a giant castle stood. It was just as large as it appeared in the distance, but we were able to see much more detail. What I had originally thought was a white building was in fact white-trimmed, natural-wood walls, covered in black and gray roofing. The inside was hand-carved wood done in the style of a traditional castle. Each floor of the castle was dedicated to a different part of Japanese life 400 years ago. On the top floor was on observatory where you could look out and see the entire city of Hiroshima. If you looked to the south, you could see the island shrine of Miyajima, a forest-covered island with a traditional Japanese arch built in the water of Hiroshima bay. It seemed untouched by time. Looking north you could see the Japanese mountains slowly losing their power but none of their majesty. After our brief journey to feudal Japan, we decided it was time to head back to the present. We left the castle grounds and walked almost due south. We were brutally brought back to the present when we crossed the Motoyasu river, a small tributary in the Ota river delta that Hiroshima is built on. On our right was Atomic Dome, an old, worn down building of brick and steel, missing all its windows and doors. Many of its walls were only partially intact with a very distinct dome on top. At first glance, it looked like an old building that needed to be removed. This building served as a hospital in WWII and was an epicenter of activity after the bomb dropped. The bomb exploded almost 100 meters above the building, sending out shockwaves that leveled the city but left the hospital mostly intact. This building was the first step in the Hiroshima Peace Memorial Park. Sitting near the side of the pond was the Hall of Remembrance. The hall was a round structure built mostly underground with a curved ramp down that lead to the entrance. Inside, we were greeted by two elderly women who did not speak English but politely pointed us in the right direction. We walked though a pair of double doors into a dimly lit hall that slowly curved to the left as it descended. The lights were low but what was around us was perfectly visible. The walls on either side of the hall had words written on them, black letters on a gold background. They were the names of every prefecture in Hiroshima in 1945, and beneath the prefecture name were the names of every person who died in that prefecture in 1945. We continued down the hall and at the bottom were brought into a large round room. In the center of the room was a small pool of water with a flat stone monument rising about three feet from it. On the monument read “8:15 a.m.,” the time the bomb was detonated. Looking up, we could see that there was stuff on the walls, and though the lighting was still dim it was quite obvious what we were looking at. It was a 360-degree panoramic view of the destroyed city of Hiroshima in 1945 taken from the view of the Atomic Dome. I hard heard the stories and seen the pictures, but it was never more real than standing in that room. A powerful feeling of reverence came over me, and neither me nor my father spoke any words. We took our time in the room to fully take it in. Then, with a new found respect for the people of Hiroshima, we left the hall. Our time in Hiroshima was just about over. We had spent about seven hours enjoying the city, and it was not nearly enough. We hailed a cab and were taken back to the Hiroshima train station. The ride back to Tokyo was quiet, the sun was down and my father and I were both very tired. I spent most of the trip reflecting on the day and pure beauty of the city. It is truly a place I will never forget. As soon as I step on the dry, tough diamond, I feel pumped ready to play ball. Once a week on Thursday I’m anxious to put my skills to the test like a high-stake poker player. I have been on the same softball team for eight of my son’s 11 years. Nothing compares to the smell of fresh cut grass and the feel of the crisp September air on my moist forehead. About fifteen minutes before my pastime begins, a list of things runs through my head like a horse race: warm up my unwilling muscles, visualize the battle that will soon start, take a deep breath and relax. After a long week at work, I feel run down, tired, and plain exhausted, but when the fourth day of the week comes a light turns on in my head and my body knows it’s time for the competition to begin. Before I step onto my field of dreams, I spend time warming up my rigid muscles. Making sure I warm up, I loosen up like the tin man after he was lubricated. I work my entire body incredibly hard every day at work, so when I stretch it out it creaks and cracks as if I were 30 years older. I start with my legs and work my way up the corporate ladder, until my body loses ten years. When I shift to my back, my spine untangles and the stress melts away. I feel thirty again. I am ready to battle! It is 6:15 p.m., and the wind is coming in from the west at approximately five m.p.h. The sun is setting, and the blood-sucking pests are feasting on my sun-glazed skin. The first time I get up to bat the anxiety and readiness is replaced by determination and fear — the same fear I felt at 15 when I asked a girl out for the first time or the fear I have of striking out. My teammates call my name and says, You’re up. I grab a tree limb. That’s what the bat feels like as my small, weak arm picks it up — it weighs a ton. 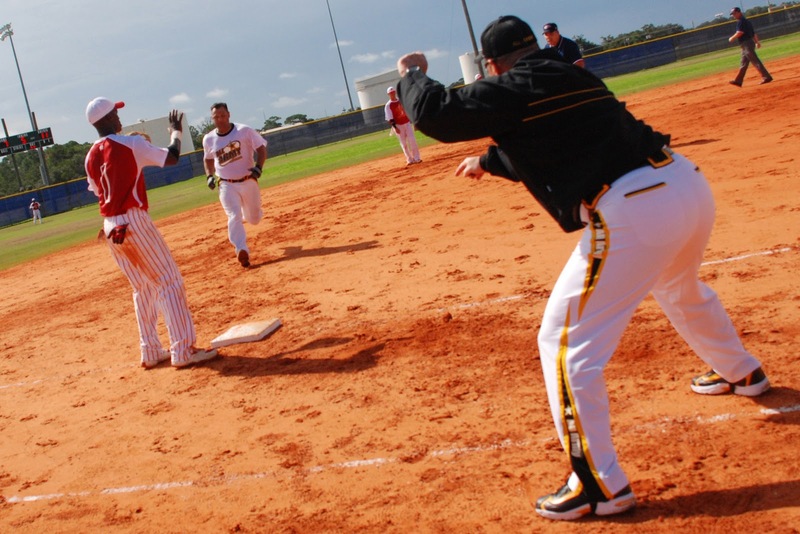 It takes all my might to throw the bat over my shoulder and walk to home plate. Then everything happens in slow motion — the whoosh of the bat past my ear and the dust rising from my feet as if I was walking on the moon. I make it to the plate, run some loose semi-dry earth over my cellist palms and take a deep breath. The smell of the earth takes me back to childhood, and I try to stare down the pitcher as if he were Goliath and I were David. He throws the rock. It’s high, and I take a ball. The nerves are coming back, and I try to fight them off like a bad addiction. He’s in my head (so he thinks), and the next ball comes lower and faster than I expected. I swing the tree limb as hard as I can, and in that split second as the bat meets the ball everything returns to normal speed. The ball resembles Apollo 11, straight up and a little to the right. I lose sight of it in the bright lights high above the field and run like a marathon sprinter to first. I’m safe. The hard part is over. Now, I can feel the burn in my lungs as they fill with fresh oxygen. I’ve burned every ounce of fuel I have, and my legs are heavy and shaking as they try to relax. I barely have time to catch my breath when my teammate John is up. Everything is silent and still as I wait for the unmistakable sound of the ball and bat smashing together like two bighorn sheep. As soon as the sound hits my ears, I bolt and run to second. In the background I hear John say, Go Go Go, and I fly past second and slide into third. The ground feels like sandpaper on my bare legs, and I can feel every pebble dig into my right leg. It feels like a really bad cat scratch. I stand up like nothing happened, but inside I’m screaming like a three-year-old child. There is no time to wipe off the blood streaming down my leg. The next batter is up. I tell my lungs and my legs, Only one more time. It is only 90 feet to home. Once again the bat cracks, and I’m off. It feels like I’m running as fast as a cheetah, but I look down at the ground at an ant traveling at the same speed. I glance left at the outfield. They just caught the ball, and I start to slow down and coast into home. Safe! I join the rest of my warriors in the dugout and congratulate them on a great win. But it’s not over. There will be another game next week, and another chance to prove myself to myself. Riding and owning a crotch rocket has been amazing. I once owned a 2004 Suzuki GSX-R600. I think everyone should own one, or ride one at least once in life. Not only does it give you that daily need for speed and a major adrenaline rush, but it is cheaper than a car and gets much better gas mileage. A used bike costs anywhere from $3,499 to $7,000 and a new bike from $10,399 to $12,899. The GSX-R600, or Gixxer, is shaped like an arrow on wheels. In the front of the bike, v-shaped headlights angle toward flat black mirrors. The frame angles up and back toward a black-tinted windscreen then down to the front tire forming an arrow tip. Continuing towards the rear, the bike becomes thinner while still following the contour shape and sharp angles of an arrow shaft. Finally, at the tail end of the bike, the body flares up and out jutting over the fat rear tire, giving it the characteristics of arrows fletchings. It has this narrow design to make it more aerodynamic on the road. The faring, which is the plastic body that covers most of the bike frame and engine, is covered in a coat of yellow paint with a glossy finish. It makes the bike shine and sparkle like a still mountain lake shimmering in the sun’s rays. On top of the paint, black Suzuki decals are pasted. They give the bike the appearance of a bumblebee, inspiring its nickname. The bike frame, wheels and tires are black and a few other bright-yellow components are scattered throughout, reinforcing its bee-like characteristics. The Gixxer has a full-Yoshimura exhaust system that includes new headers and a custom carbon fiber half can in the end of the exhaust pipe. My bike is also equipped with a power commander. This allows me to change and play with my bike’s fuel maps as I see fit and gives the bike the ability to go faster and have more power in certain gears. It also allows me to tune the Yoshimura aftermarket exhaust pipe so that it works with my Gixxer. My Gsxr-600 is a beautiful bike standing still, but on the road it is a blur of yellow rocketing past. The Yoshimura exhaust system makes the bike obnoxiously loud. It sounds like a pissed off bee zipping down the road. Looking at this bike and hearing it roar is a real treat, but taking it for a ride is like sitting on a rocket. Its power-to-weight ratio is amazing. It has a 599cc, four-stroke, liquid-cooled, DOHC (double overhead camshaft) engine with a six-speed transmission and an ungodly quick acceleration of 60 to 80 mph in 4.44 seconds or 80 to 100 mph in 4.77 seconds, with a top speed of 170 mph. When I ride, I pray I find an open road so that I can let the 170 horses roaring beneath me run. I have the most fun on a long straight road. I rip back the throttle and slam through its six gears to see how far into the tunnel I can go before my vision blurs. It’s also fun to ride up through a mountain canyon and bash through the turns like a fish fighting through a raging river. On top of the crazy adrenaline rush I get from riding my bike, I also love riding because it is so freeing. It is the closest thing to flying there is while remaining on solid ground. I bought my bike at the beginning of summer, and it has been incredible. I had to sell it recently but received approximately the same price I bought it for. The guy I sold it to reminds me of me when I bought it. He was eager to push its limits on the road. I know the bike went to a good home where it won’t sit in the garage and collect dust like an antique on grandma’s shelf. I know he will let the horses in the Gixxer stretch their legs on the open road, and the bike will treat him as well as it did me. I have awesome memories riding Bumblebee and will never forget my first bike. However, I can’t wait to buy the new 2011 Kawasaki Ninja ZX-10R, which has way more power and is much faster. Then I can try to get a little farther into that tunnel. Most of us know the stereotypical image the Caribbean islands portray, but not a lot know where it is and even less have visited. I’m one of the few lucky who’ve travelled there and in the process learned where it is located. Images in photos don’t do the islands justice. Seeing the Caribbeans firsthand on a cruise was a whole different ballgame. For once, it wasn’t the journey that amazed me, but the destination, although the journey was great too. After what seemed like forever, the massive white cruise ship that had connected sky and sea for two days flowed through the transparent water into the port of St. Thomas. We watched the water change from a dark murky green to dark blue to crystal blue. A few friendly gray bottlenose dolphins had been bold enough to swim close to the ship and a few erroneous whales had been sighted. Even though the weather was the perfect condition for sailing and there had been tons to do on board, we couldn’t wait to get off the boat. Everybody was excited to finally set foot on solid ground and lose their sea legs, so there was a very crowded scramble as everyone rushed back to their room to grab the necessities: room key, proof of ID, camera, and of course, cash. We hurried downstairs just in time to stand in a three-mile line as people waited to get off the ship. Eventually, we made it through the security checkpoint and off the boat where we saw was a great deal of tourists who, like us, had just arrived from other cruise ships. We squished our way past and walked through a gigantic rust-colored stone arc which led through to a city in St. Thomas. A lively mariachi band greeted us with music and loud shouts of, “Welcome to Saint Thomas!” A warm, welcoming committee followed close behind handing out brochures, maps, and little cups of clear liquid. The complementary cups were filled with vodka, which we gladly used to toast our arrival. As we walked further into the city, we discovered countless little wooden stands offering free shot samples to promote various liquors that could be purchased in the city. The path from the docks began as cement but quickly turned into roads of gray and brown gravel with undertones of reddish-brown dirt, which led to the main streets of pleasantly, dirty tan cobblestones. Next to the narrow streets were sidewalks on which blocks of colorful rectangular buildings with unique doors stood. They turned out to be residences of people on the island. We leisurely walked through the city, stopping at most of the modest little shops, boutiques, and cafes. The stores on each block were all connected, just like the homes, distinguished only by display windows and signs. After four hours, we boarded the ship and were off to the next island. A few hours later we docked at Puerto Rico. Once again, we went through the same boring, time-consuming process of standing in line to get off the ship. At the end of the platform, a friendly, helpful welcoming committee offered us alcoholic beverages and information. After listening to the options, we decided to check out the historical 16th-century fortress of El Morro and then hit the beach. El Morro was unbelievable. Miles of lush, green grass led to the large stone medieval castle of Fort San Filipe del Morro, built in 1539 by Charles King V of Spain to defend the port of San Juan. The grass was just tall enough to sway in the wind but short enough to tickle our ankles. When we finally arrived at the building, a policeman on a moped turned us away. The building was undergoing renovations and would welcome the public in a week. Even though we didn’t see inside, the breathtaking architecture of the 18-foot thick stone walls set against the landscape of sea and grass was more than enough to take in. We weren’t disappointed. Tired from walking and taking pictures, we took a bus to the beach. The bus was a cross between a jeep and a golf cart, similar to a safari truck but with larger, more bus-like characteristics. We had no seatbelts, and the narrow, winding roads of broken cement and gravel made the ride scary and fun. 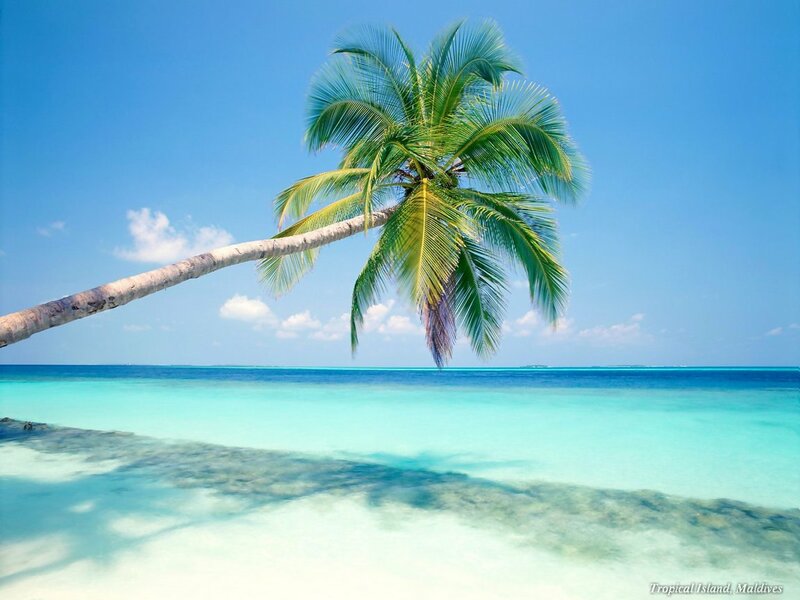 An endless line of palm trees outlined the edge of the shore. I was bombarded by images beyond the trees. Clear blue sky lacked clouds, and the air smelled like clean, salty rain. The white sand was littered with hammocks, people, chairs and vendor stands but no trash. The ocean defined the color blue and was so salty I wondered how I didn’t prune up faster. It was amazing. I had never seen anything like it before. The Caribbeans are something everyone should experience firsthand because it isn’t cluttered by factories and skyscrapers. It is a totally different ballgame. 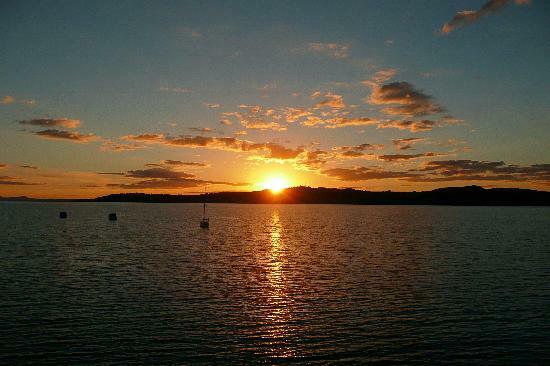 As the sun sets over the lake and turns the sky a deep burnt red, a relaxing tranquility sets over the lake as it begins its nightly rest. The waves no longer crash but smoothly glide up and down the beach, as a silence glides across the water. I sit surrounded by the noise coming from my friends and the camps nearby, but as I look across the water the noise begins to dwindle. I zone out only briefly on my friends, but as I stare across the water I know I am right where I want to be. It is the first night there at the lake and we are frantically running around, each of us on our own little mission to set up camp. It turns into a human version of bumper cars. People are jumping and twirling as if we are in a musical, and the noise of hammering and the crackle of the fire are the tune of our music. The tents begin to pop up around the campfire one by one as if they are dandelions in the grass, just in time before the sun fully falls behind the landscape to the west, like lights going off at the end of a show. That night we collapse in our tents for some much needed hibernation and prepare for our first full day on the water. We arise bright and early at 10 o’clock with the sun almost at its peak in the sky. At first there is slowness around the camp that spreads slowly like a virus but is gone in a flash. After we eat pancakes, three of us pile into the boat while one person remains in the truck so we can launch. The boat touches the water, and with a swift turn of the key a roar echoes across the lake as if to say to everyone, “We’re here.” We float in the marina as we wait for the last man to walk down to the dock, all of us antsy to get out there. Once we are all in the boat, stillness overcomes us and smiles begin to crawl across our faces. With a fast silent motion, I floor it and we scream out toward the middle of the lake. I am the captain of the boat because it is my family’s boat. The other three fight to see who will go wakeboarding first, and finally we have a body in the water attached to a rope. A chilly yell comes out from behind the boat and the day has officially begun. The four of us speed around the lake boarding and tubing for six straight hours until we are starving and forced to head in for lunch. The afternoon comes and goes in a blur, and soon we are back at camp digging into some cheeseburgers and fruit. I turn and see the same sunset I saw the night before. My focus shifts from the antics of the three guys to this sight. The sun is the same deep burnt red and the water is flat across the lake like someone laid a mirror on top of the earth. I watch the waves gently gliding up and down the beach. The sunset is more intense tonight than it was the night before, and as I turn my gaze from the beauty of the water toward the sky, individual stars begin to poke through the blue sky and to slowly take over the night. Another day passes which cannot be relieved but which will remain in my memory. That night we go a little crazy. Four 21-year-old boys are always ready to have a good time. Two boys get a little too drunk and start yelling R-rated phrases in the voice of Yoda. Even as entertaining as that is, I still can’t forget the scene I witnessed right before dusk. Morning comes and the overall mood in the camp is low. We all feel like we’ve been hit in the head with a hammer or a frying pan. However, a girl arrives early in the morning and is nice enough to make us some French toast, which quickly gets us up and on our feet. We all become magicians, and the toast disappears quickly. The morning is a replay of the morning before. In the afternoon, unfriendly weather comes in with strong gusts of wind and thunder crashes in the sky, which produce unruly waves for boarding but some big air for tubing. The clouds and wind soon disappear, and the five of us make our way toward the marina and pull the boat out on the water for one final night on the lake. Later, as we begin to pack up the camp stuff we don’t need that night, I turn and see the same sunset for the third straight night in a row. I realize that the lake isn’t just a lake, it is an escape, an escape from the hustle and bustle of life. I understand how the world can sometimes slow down so we can appreciate our time with friends.